Five thousand pounds of food would fill a lot of grocery carts. More to the point, it could and will fill a lot of stomachs. That’s the amount of an unsolicited donation given by Goya Foods, the largest Hispanic-owned food company in America, to Nutritional Development Services of the Archdiocese of Philadelphia. The food shipment, which arrived at the SHARE Food Program warehouse on West Hunting Park Avenue in Philadelphia on Dec. 10, will be distributed by NDS to 50 food cupboards throughout the archdiocese, according to Lorraine Knight, executive director of NDS. 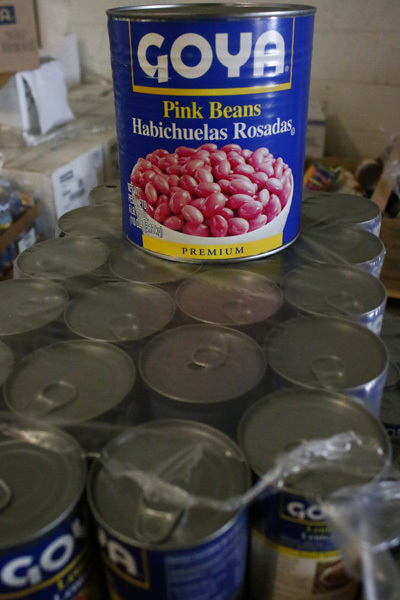 Included in the donation were such staples as rice, beans, canned vegetables, olive oil and vegetable oil. “It’s incredibly good shelf-stable food that we really do need,” Knight said, but she does not expect it to stay on the shelves for any length of time. Although Goya specializes in Hispanic favorites in its products, these are really items any family could use. “If I were going to make split pea soup I would use Goya split peas,” Knight said. This is not the first time the archdiocese has received food from Goya, which has a history of social consciousness. Last year, when Pope Francis visited the city, Goya marked the event by a huge donation 50,000 pounds of food funneled through NDS. This time, the event which triggered the donation was the International Unity Cup, a soccer tournament involving 32 teams from around the world with a championship at Citizens Bank Park. When Knight received the call from Goya asking if NDS would be willing to accept the donation “it took me about three seconds to say ‘yes,’” she recalls. The need for food for those who are less fortunate is ever-present, and if anything it is growing. “It’s not just between Thanksgiving and Christmas. Our food drives are ongoing,” Knight said. During the most recent fiscal year ending June 30, 2016, NDS collected 1,126,125 pounds of food worth $1,756,132, enabling the agency to provide the equivalent of 2,386,585 meals to the community. That was an increase of 6 percent over the previous year. This month’s 5,000-pound Goya donation earmarked for NDS was shipped to the SHARE warehouse because SHARE, another large food program in Philadelphia, has sufficient space to receive it. 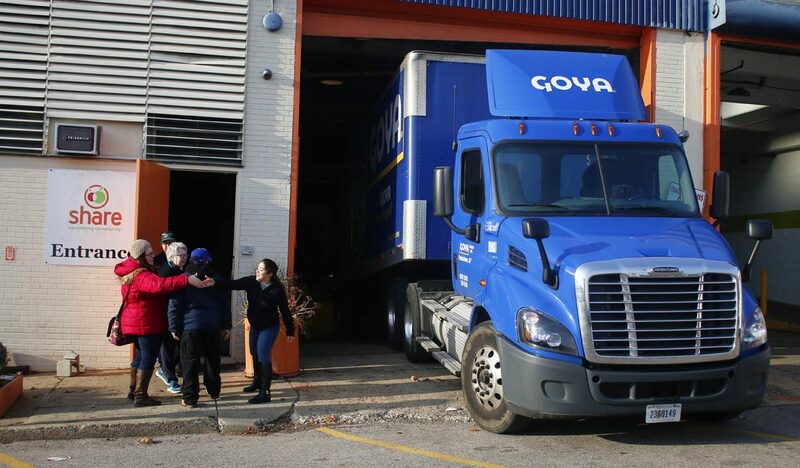 The SHARE Food Program warehouse on West Hunting Park Avenue in Philadelphia receives the Goya donation Dec. 10. The partnership between archdiocesan Nutritional Development Services and SHARE is “an example of the cooperation of all of the hunger groups in Philadelphia,” said NDS Executive Director Lorraine Knight. “We work as a team, we have a common goal.